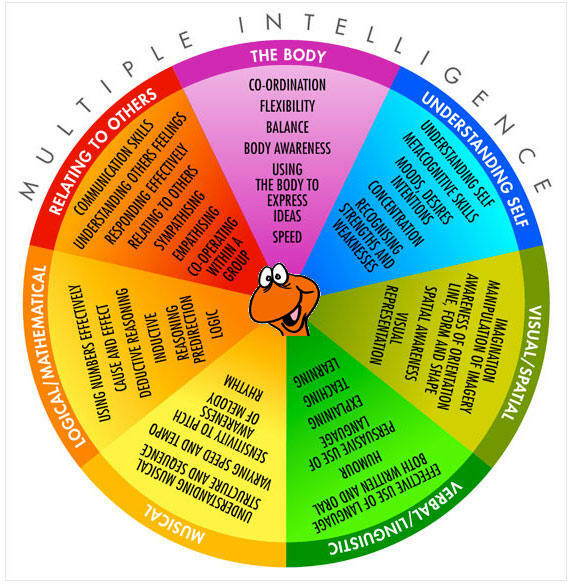 Multiple Intelligences is the name of a theory of learning and extensive body of research by Howard Gardner and his team of researchers at Harvard's Graduate School of Education. First published in the book "Frame of Mind," M.I. describes the various learning faculties that everyone has hard-wired in the brain. 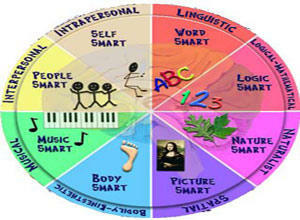 These intelligences are not isolated from each other. They overlap, and can and do work with each other. And each can be developed, though people tend to have strengths. For teaching purposes, the implication is simple. We should teach in such ways as to stimulate all the ways our students can learn a subject to create a deeper and richer learning and memory experience. According to Gardner, the educational application of MI is simply this: "Pluralization" -or what we in Rotation call, teach a concept or Bible story using a variety of approaches, not just one. Coincidentally, the brain research is showing that we also remember and process information in different ways and places in the brain. In that sense, by teaching through multiple brain locations and processes, we are also helping to create a deeper memory and richer understanding of the subject. 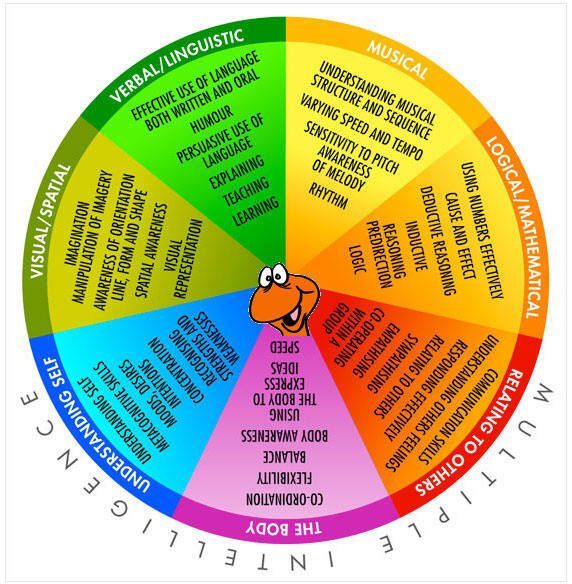 Multiple Intelligences is NOT to be confused with the "Learning Styles" theory, though it often is, and they two theories have some similarities. "L.S." has now largely been debunked because unlike M.I., Learning Styles theory suggests that teachers should concentrate their methods in only a few "styles" (visual, for example) to be successful, and that students do better in their "preferred" style. M.I. says we learn best when we use ALL our learning faculties (intelligences) to understand a subject. An interesting thing about the Rotation Model is that we created the Model BEFORE ever learning about Multiple Intelligence or the Learning Style theory. We were simply trying to "divide and conquer" a BIG problem we had in Sunday School. We had teachers using only a few methods (talk + craft, for example) and then subjecting a class for an entire year to that over-used activity, and ignoring all the other creative teaching methods we knew worked. To solve this problem in Sunday School, and several others, we knew we had to spend more than one week on a subject, and re-organize our classrooms so that one teacher didn't have to be the master of all techniques. We also knew that we needed more than one week per story if we wanted to teach the story deeply with a number of techniques. Our solution was to reorganize classrooms and lesson plans into "Workshops" -into which students rotated for four to five weeks per story, yet each workshop would have a different teacher and creative approach to the story. Rotating the kids allows us to switch the teaching approach each week, and also allows the teacher to stay-put in the workshop they favor --teaching the same (and improving) lesson plan to a different group each week. This solved the "preparation" problem created when you switch the story every week, while allowing us to teach with many different methods. When you compare this list to Gardener's Multiple Intelligences, you can see the parallels. 1) Verbal-linguistic intelligence: ability to analyze written and verbal information. 2) Logical-mathematical intelligence: ability to use and understand calculations, symbolism, and mathematics. 3) Visual-spatial intelligence: ability to use and understand maps, design, visual arts, and architecture. 4) Musical intelligence: ability to produce and compose different patterns of sound. 5) Naturalistic intelligence: ability to use and understand botanical, zoological, meteorological, geological features of the world. 6) Bodily-kinesthetic intelligence: ability to develop complex athletic skills such as dance. 7) Interpersonal intelligence: ability to understand others’ desires, motives, and intentions. 8) Intrapersonal intelligence: ability to recognize and understand one's own desires, motives, and intentions. Interestingly, Gardner and others have posited a 9th "spiritual" or "existential" intelligence. It's wonderful that the brain research supports what creative teachers have always known! What the Rotation Model does is give leaders a STRUCTURE to IMPLEMENT these best practices, and expand the use of certain teaching techniques that are under-utilized. P.S. I will sometimes call "multiple intelligences" learning "senses" or "lenses." "Senses" doesn't just mean sight, taste, smell, etc., those these are important ways we can interact with information. Music is not just an auditory event, it can invoke our "soul" sense, feelings. And M.I. theory says that "musical intelligence" is not just about sound, it's about rhythm. In that "sense," keeping time is a sense too. Rev Don Griggs wrote the following summary of Gardener's 7 Intelligences for the Logos Program when he was their editor and published a copy of it at our site a number of years ago. Don is considered one of the Presbyterian Church's greatest Christian educators. After teaching creatively for many years, teaching CE in seminaries, and authoring numerous books and curriculums, he adopted the Rotation Model in his church and taught about it in numerous seminars. The brain has different regions where learning occurs. Each region features a different way it processes information and memories. These unique aptitudes are sometimes described as "intelligence." Each region has its own unique approach and skill for acquiring, processing and expressing information. Each of these regions is interconnected with others, and all are connected to our senses (sight, sound, etc., consciousness, and gut (feelings). Each of us has a preference or aptitude for using certain intelligence, though we all possess and use each one. And as you can quickly see, many Sunday School activities utilize many of our learning intelligences. Through...verbal presentations, large-small group discussions, books, worksheets, writing activities, word games, research, student reports, storytelling, publishing newsletters, using computers, journal writing, choral reading, debates, scripts, poems, re-writing stories. Quantify it, conceptualize it, think critically about it, solving. Through...classifying or categorizing subject matter, logical puzzles or games, creating codes, scientific demonstrations, problem solving, Socratic questioning, etc. See it, draw it, visualize it, color it, mind-map it, symbolize it, size it up. Through...charts, graphs, maps, diagrams, photography, slides, visual puzzles, painting, drawing, collages, montage, art prints, illustrating, graphic symbols, video, etc. Act it out, dance it, build it, touch it. 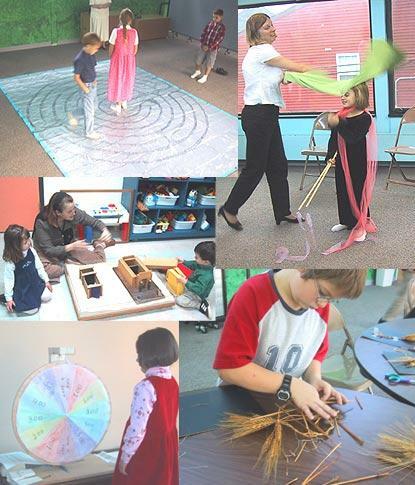 Through drama, puppets, mime, creative movement, signing, crafts, role playing, competitive and cooperative games, hands-on activities of all kinds, building projects, physical expression, sculpting with clay, etc. Through ...singing, humming, playing musical instruments, rhythms, creating songs, listening to recordings, background music, group singing, etc. Teach it, discuss it, collaborate on it, interact with respect to it. Through...cooperative group activity, board games, skits, simulations, group brainstorming, group planning, conversation, etc. Through...independent study, self-expression through art or music, self-paced instruction, individualized projects and games, journal keeping, self-esteem activities, personal goal setting and planning, application to personal life, etc. The traditional "structure" of school, does not always allow for their stimulation or development. "Sit still and listen" for example, stunts the use of other learning faculties. They also create boredom and distraction for students who need visual or movement, for example, and are fed a steady diet of linguistic or logical. Brain research has largely confirmed and expanded on the notion of these "learning intelligences." We are "wonderfully made." This think piece appeared at our old website when the knowledge of learning intelligences was in its infancy. 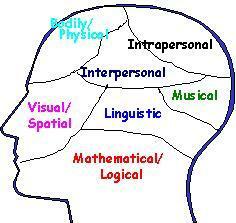 I remember when nobody outside of public school teachers had every heard of "the 7 Intelligences." Then after hearing it, some folks were content "just to be creative," or "make the kids happy." But as you can tell by the Rotation Model's EMBRACE of educational research, we're serious about doing our best to share God's Word in powerful and memorable lessons. Given the diminished support and respect for Sunday School education in many quarters, its time we reminded folks that we're engaged in a serious educational ministry that looks to do more than just "make the kids happy" or decorate rooms. I hope you can use some of these insights to guide your program and stoke your teacher training. Our Seven Intelligences work together in complex ways. They do not "stand alone" but rather, are always interacting with each other. Music, for example, also typically involves bodily and interpersonal. It also has an emotional, visceral component as well --which as I describe below, may involve the "8th Intelligence." Learning about the Prodigal Son through art instead of games is different, but different does not mean better. The point is to learn it through as MANY different learning pathways to deepen the understanding and memory, and to appeal to the wide variety of students and teacher's talents. Many years ago, a researcher from UCLA speaking at a Rotation Conference organized by Don Griggs, told us about a much debated "8th Intelligence" she and Gardener called "Spiritual Intelligence". (Some secular educators and old books call it "moral" intelligence, but the brain research has confirmed that the brain's moral processes is frontal lobe, whereas emotions and sense of being are processed elsewhere in the mind. Spiritual Intelligence is the deeper sense of self that grasps, reflects, and respond. Lesson Reflection, reflective activities, prayer, ...these types of activities feed that particular learning lense. But there is more. Gardener's 8th Intelligence is probably also describing what other researchers describe as our "EMOTIONAL" memory, --the way we feel when we're learning that gets imprinted on the content. For example, life lessons learned the hard way are usually recalled with a twinge of pain. Feeling loved while learning about love, creates a positive association that strengthens the content. Naturally, the brain's memory wants to suppress what it didn't like. And negative emotions during and after learning impeded recall. This is a major reason why Rotation Modelers believe in great activities and friendly spaces. Emotional content is quickly created and retrieved. That's because the brain processes and stores emotional content in the Limbic system, which is an evolutionarily ancient part of the brain designed to produce fight or flight, enjoy or reject. (Smell memories are the fastest. A bad smelling classroom can evoke bad memories, and imprint negative connotations on an otherwise lovely lesson!) When a student REACTS to a story or learning experience, they develop an emotional or "gut" feeling/memory which can last a lifetime. These learning "areas" are not distinct or dis-connected in the brain. They are bound together, enhancing and information each other to produce our mind, our understanding, our memories. How the WoRM Capitalizes on "M.I." The workshops in the Rotation Model are specialized rooms that provide us with the STRUCTURAL EXPECTATION AND ENVIRONMENT to EMPHASIZE DIFFERENT LENSES or styles. Rather than "hoping" our teachers will teach through many senses/lenses, the model designates specific rooms and teachers to utilize a specific set of learning activities. 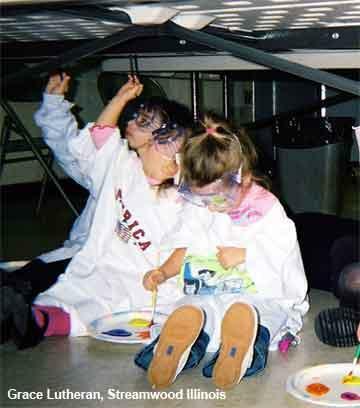 In reality, an Art Workshop lesson employs many of the learning senses, if not all! But the main activity zeroes in on a creative method, and does so with a teacher who is comfortable in that medium and will not ignore it. In the old model, "the teacher" who led the same class every week, tended to teach in styles they were comfortable with and limited by. In the old model, the teacher picked and chose their way through the lesson plans we handed them, and often ignored media, or projects that required too much preparation because they didn't have the time to set up a creative project for just one week, and have to do it all over again the next week. The Rotation Model has the teacher repeating the creative lesson for several weeks in a row, each week to a different group, so the teacher gets better each week at the lesson, but the kids get a variety of approaches. 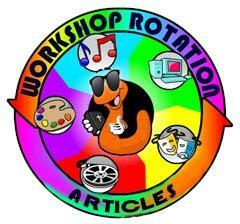 Thus, "rotation" is not to relieve boredom, or a plan to dress up classrooms. It is a very conscious attempt to make sure creative methods are getting used. We all stand on other people's shoulders. I first came across Gardner's Multiple Intelligence research in 1993 thanks to an article by Christian educator Marlene Lefever. It was two years after we had launched the Rotation Model and it made us look like we knew what we were doing --educationally speaking! Marlene had written an article in a Christian education magazine titled, "Learning Styles in Christian Teaching." She later turned the article into the book by the same name for David C Cook. Learning "Styles" has since grown into its own discipline apart from Multiple Intelligences. And "L.S." has now somewhat been debunked or re-thought. Even Howard Gardner has pointed out that M.I. is not about learning "styles." His research says we are wired for ALL styles of learning. Learning Styles people made the mistake of emphasizing one over others. Marlene's book didn't do that. In fact, her book was actually more about M.I. Marlene's Learning Styles book drew heavily on Howard Gardner's Multiple Intelligence research. I called her to ask some questions and see if she knew of any church doing something like the Rotation Model. She was excited to see how we had restructured our program to ACCENTUATE learning styles and came to visit us several weeks later. She lived about an hour away, which seemed like dumb luck to me! We asked her to come back and teach our congregation about the educational underpinning for what we had created. Her validation spurred us to begin telling other churches about what we were doing, and her visits gave us some new ideas. Marlene's book referenced another book called the "4MAT System" -a roadmap to reinvent public schools based on Gardener's multiple-intelligence research. It was written by Bernice McCarthy, a student of Howard Gardner's. She had created a center to train public school educators in M.I. Now here's the kicker.... When I looked up Bernice's address to contact her, I was shocked to find that she lived ten minutes away from our church in Barrington IL. And furthermore, SHE was a Sunday School teacher in a neighboring church. She was equally shocked that a Sunday School had already implemented what she was trying to implement in public school --a different way to organize our teaching and teachers to improve learning and the student's experience. I've since met some great Christian educators who were applying M.I. to their teaching decades before Gardener's research. There has been no lack of creativity in traditional materials, only a lack of a better model to HARNESS that creativity. M.I. tells us that our creative impulses were and are absolutely correct, --that creativity is not merely "entertainment." The Workshop Rotation Model gives us a sustainable and exciting FRAMEWORK to FOCUS and INCREASE the benefits and variety of M.I.-informed & infused Bible education. Since the advent of Gardner's research, a number of books have been written in Christian education talking about learning styles and intelligence. If you want to learn more about them, search Amazon or your local Christian bookstore or resource center. The more we understand about best approaches, the better we teach, and the more support we will have within our congregations. Here's are two handy graphics you can save and paste into your training docs. This comes at at wonderful time as we are getting ready to kick off our Fall program! I love having this info to update my brochure on Rotation and why we do it at our church. Very timely!